School is upon us and it got us thinking lunch boxes… how boring, right? 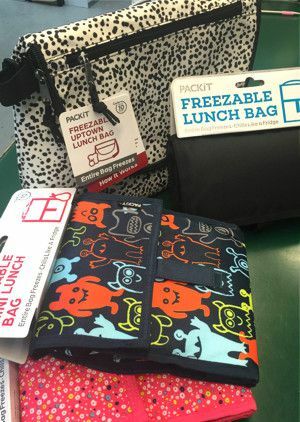 Well, we like to think that the freezable lunch bags from the PackIt company add a little excitement to the ordinarily boring lunch box! What makes a PackIt lunch bag unique? All of their products are freezable. Simply put them in the freezer the day before use and the next day you have an insulated lunch bag that will keep your lunch cool until ready to eat. It is great for juice, dairy products, meats, and cheeses that could spoil in a warm lunch bag. What makes them so exciting? These lunch bags are available in different sizes and different styles. There are fun patterns, solid colors, and stylish designs to choose from. There are various sizes as well, including mini, regular, an over-the-shoulder bags. We are constantly bringing in new styles and colors, so we recommend stopping in to our Housewares Department to see our newest assortment! PackIt: Fold, Freeze, Pack & Go! PackIt is the only bag that keeps food and drinks cool for up to 10 hours - no ice packs needed. Its secret sauce? A patented freezable gel that's built into the walls of the bag. Just Fold, Freeze, Pack & Go!